When you’re seeking treatment for something, whether it’s a broken leg, a sore back, or chronic migraines, it’s in your best interest to be an involved patient. In order to get the best medicine, you have to be present, sharing pertinent details so your doctor has the whole picture. Think 0f it like this – the more you put in to the appointment yourself, the more you’ll get out of it. Here are simple ways to become a savvier chiropractic patient, so that every appointment is effective. When you visit Dr. McSweeney for the first time, she asks that you arrive a little ahead of your appointment time. This is to allow enough time to complete paperwork that shares your full health history – and that includes things that may not even seem related to the problem you came in to have treated. Here’s why. 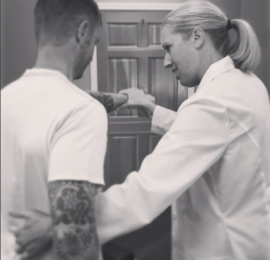 The chiropractic focus is on whole-body health, which means the best way to make a plan for your treatment is with a good grasp on your overall health. If you’ve had major injuries or illnesses, or if you have pre-existing conditions, these are issues to mention. Medications, sleep quality, exercise, how often you get sick – these are all worth including. When it comes to your health history, Dr. McSweeney would rather hear too much than not enough. Often, Dr. McSweeney will give you recommendations for home care. These may include icing, specific stretches, or other instructions, and they’re intended to help you manage any discomfort and maintain your adjustment or mobilization treatment. It’s not the end of the world if you don’t follow through, but you’ll likely be much happier if you do! If you’re dealing with specialized issues like pregnancy-related joint pain, allergies, migraines or you want someone to treat a child, be direct. Ask about your chiropractor’s experience in a specific issue, and even for referrals if you want to learn more from the patient’s perspective. You’ll be better served with someone who has direct experience treating patients with the same issues, so don’t be afraid to ask.